Workers lowered a huge dome over an oil leak gushing from a sunken rig deep in the Gulf of Mexico as energy giant BP battled the slick lapping ashore on protected islands off the US coast. The complex, unprecedented operation to drop the 100-ton (90-tonne) chamber some 5,000 feet (1,500 meters) below the surface to cap the leak from the fallen rig was expected to be completed late Friday. BP officials said the dome was suspended about 200 feet (60 meters) above the collapsed rig as it was swung laterally into place using remote-controlled submarines. "It's currently been installed on the ocean floor," BP spokesman Doug Suttles told journalists after the dome began its descent late Thursday. "This is a very large device and needs to be very precisely placed," Suttles said, adding engineers would "swing it over and they had to precisely lower it over the top of the leak point." 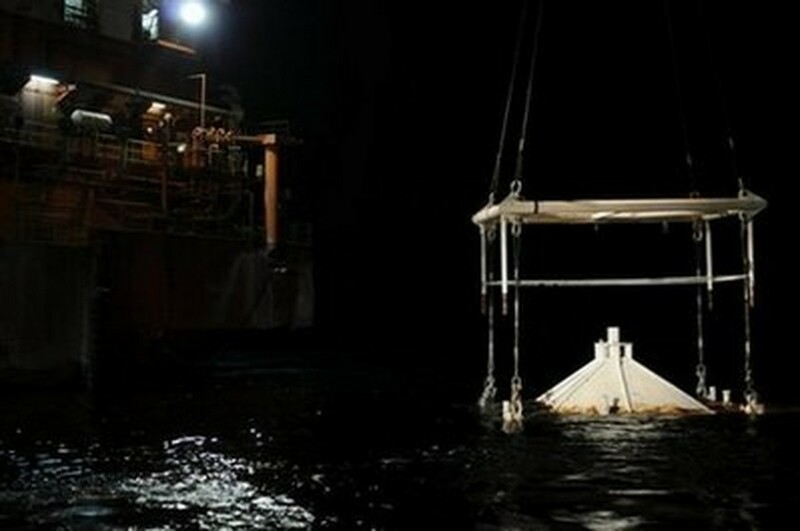 "Over the weekend, we expect to connect that dome to the drill ship Enterprise and hopefully beginning of next week, we'll begin to start to evacuate the oil from the sea bed up to the surface." The British energy company is racing to contain the leak, hemorrhaging some 200,000 gallons of oil a day into the Gulf of Mexico from the sunken Deepwater Horizon rig that exploded on April 20, killing 11 workers. And the delicate operation is seen as the best hope to stave off the biggest US environmental disaster since the 1989 Exxon Valdez spill in Alaska, but officials remain cautious about whether it will work. "This has never been done in 5,000 feet of water. It's a technology first. It works in three (hundred) to 400 feet of water. But the pressures and temperatures are very different here," BP's chief executive officer Tony Hayward warned on CNN. "We cannot be confident that it will work." Oil sheen from the massive crude spill has begun washing ashore on the Chandeleur Islands, some 60 miles (100 kilometers) off Louisiana, forcing US officials Friday to close a wildlife refuge there. "The refuge closure is important to keep the public safe, to minimize disturbance to nesting colonial sea birds, and to allow personnel conducting cleanup operations and recovery efforts to work safely and efficiently," officials said in a statement. The Breton National Wildlife Refuge refuge, home to endangered species of brown pelican, least tern and piping plover, is one of the oldest in the country, and spreads across almost 7,000 acres (2,800 hectares). The National Oceanic and Atmospheric Administration (NOAA) meanwhile also extended the area closed to commercial and recreational fishing to 4.5 percent of Gulf waters, saying the fishing ban would remain in place until May 17. News the sheen is reaching Louisiana's outlying shores raises new fears for the fragile ecosystem of its wetlands and shores -- home to vital spawning grounds for fish, shrimp and crabs as well as a major migratory stop for rare birds. Commercial fishermen in the Gulf harvested more than a billion pounds of finfish and shellfish in 2008, while it is also a key fishing grounds for recreational fishermen. BP is also spraying dispersants over the slick to break it up, and deploying thousands of booms to try to contain the spreading oil. Amid concerns over the exact make-up of the chemicals being flushed into the waters, US officials said they produced a similar effect to dishwashing liquid. "It's really designed to break down the oil," said Bob Perciasepe, deputy administrator of the Environmental Protection Agency (EPA). "It does not make the oil disappear but it makes it into smaller and smaller particles that makes easier over the long haul to be biodegradable instead of big... really, oily globs." Political fallout over the spill also grew as a key US senator warned action on legislation to fight climate change was now "impossible" due to fierce new opposition to offshore drilling in the wake of the disaster. "I believe it would be wise to pause the process and reassess where we stand," Republican Senator Lindsey Graham said.